Also see: D minor, or D-flat major. 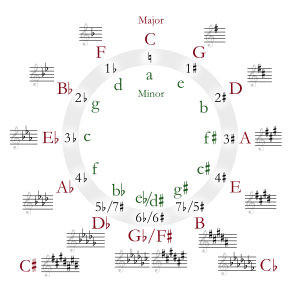 D major (or the key of D) is a major scale based on D, consisting of the pitches D, E, F♯, G, A, B, and C♯. Its key signature consists of two sharps. Its relative minor is B minor and its parallel minor is D minor. D major is well-suited to violin music because of the structure of the instrument, which is tuned G D A E. The open strings resonate sympathetically with the D string, producing a sound that is especially brilliant. It is thus no coincidence that many classical composers throughout the centuries have chosen to write violin concertos in D major, including those by Mozart (No. 2, 1775, No. 4, 1775); Ludwig van Beethoven (1806); Paganini (No. 1, 1817); Brahms (1878); Tchaikovsky (1878); Prokofiev (No. 1, 1917); Stravinsky (1931); and Korngold (1945). Ascending and descending D major scale. It is also appropriate for guitar music, with drop D tuning making two Ds available as open strings. For some beginning wind instrument students, however, D major is not a very suitable key, since it transposes to E major on B-flat wind instruments, and beginning methods generally tend to avoid keys with more than three sharps. Even so, the clarinet in B-flat is still often used for music in D major, and is perhaps the sharpest key that is practical for the instrument. There are composers however who, in writing a piece in D minor with B-flat clarinets, will have them change to clarinets in A if the music switches to D major. The vast majority of tin whistles are in D, since they are often used in music with fiddles. In the Baroque period, D major was regarded as "the key of glory"; hence many trumpet concertos were in D major, such as those by Fasch, Gross, Molter (No. 2), Leopold Mozart, Telemann (No. 2), and Giuseppe Torelli. Many trumpet sonatas were in D major, too, such as those by Corelli, Franceschini, Purcell, Torelli, etc. "The Trumpet Shall Sound" and the "Hallelujah" chorus from Handel's Messiah, and his coronation anthem Zadok the Priest are also in D major. With the invention of the valve trumpet, however, preference shifted to the flatter keys, and thus Haydn wrote his famous trumpet concerto in the key of E-flat major. 23 of Haydn's 104 symphonies are in D major, making it the most often used main key of his symphonies. The vast majority of Mozart's unnumbered symphonies are in D major, namely K. 66c, 81/73, 97/73m, 95/73n, 120/111a and 161/163/141a. The symphony evolved from the overture, and "D major was by far the most common key for overtures in the second half of the eighteenth century." This continued even into the Romantic Period, and was used for the "triumphant" final movements of several symphonies, including Beethoven's Ninth Symphony, Gustav Mahler's Titan symphony, and Jean Sibelius' Second Symphony. Scriabin considered D major to be golden in color and, in a discussion with Rimsky-Korsakov, he gave an example from one of Rimsky-Korsakov's own operas where a character sang in D major about gold. ^ Rita Steblin: A History of Key Characteristics in the Eighteenth and Early Nineteenth Centuries (Rochester, University of Rochester Press: 1996) p. 124 "The key of triumph, of Hallelujahs, of war-cries, of victory-rejoicing." ^ Rice, John (1998). Antonio Salieri & Viennese Opera. Chicago: University of Chicago Press. p. 124. This article is licensed under the GNU Free Documentation License. It uses material from the Wikipedia article "D major". Allthough most Wikipedia articles provide accurate information accuracy can not be guaranteed.